Between the top two candidates, the results say, 80 to 85 % of Lusaka registered voters stayed home, remember it was a public holiday so no excuses there. The winning candidate got 81,936 equal to only one constituency, Lusaka central. So what are the 80% of voters thinking? No need to vote it’s a rigged system vis a vis 2016 elections? Remember KK “NO” vote meant NO change why bother? It’s just a mayor election who cares? What about the return on investments? How much capital did the PF put in this election? 15% gross revenue will get you fired in any company. Suppose civility returns to our elections where violence is not part of the strategy, we make it fun and not a matter of life and death, could that help?, but of course the PF doesn’t like that, it is a losing strategy. The day after the elections, how confident are you? Do you feel you have the mandate to rule if you do not really know what the 80% of the people are thinking including your own supporters? Are they still thinking about the fire trucks? So many questions mwe! UPND these numbers should not scare you, in the next 3 years go into overdrive, identify the voters and lock them up. People have lost intrest in voting period…. True.Why waste time going to vote if I already know that ECZ is full of pfoooooooooooooool cadres…..
Trust me drop the cadres and set the country free from insults and violence and let the roll of cadres be taken up by the security wings. We are losing everything and it’s worrying seeing and hearing insults on social media. We are one big family. Let there be love and harmony in the country. No cadre respects anyone from both parties. Please it’s going to get out of way if unchecked. Upnd stop comforting yourself. Sure, how you can compare the moods of general and tripartite elections to mayoral by election..? If Lusaka dwellers have lost interest in PF , why didn’t they vote for upnd..? 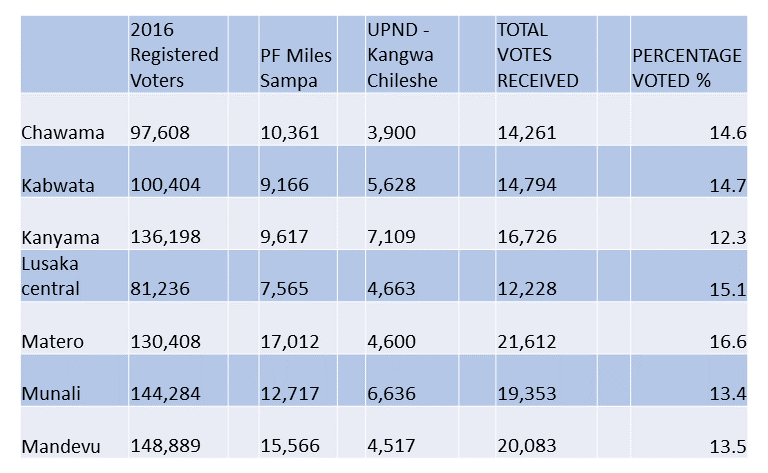 If really PF and upnd are near to each other in terms of popularity, why the ratio was 3:1…? Keep on closing your sights. Otherwise 2021 is near. I am a UPND sympathizer who did not vote for one reason: a mayor from opposition to preside over a Council 100 PF councilors was going to Project UPND badly and cost the party the fortunes ahead. It’s better to let PF run away with this one for now. We simply did not want UPND to win and those 36000 who went to vote were the die hards. Had UPND won these elections the UPND sycophants and zealots and enemies of progress would have been saying PF has lost popularity now they’re comforting themselves in their warped theories. Whatever this article wishes to justify, one can see that peopled STAYED AWAY BECAUSE THEY SAW NO VALUE IN EITHER CHANGE OR STATUS QUO!! This means that the front runners PF and UPND are BECOMING IRRELEVANT TO THE MAJORITY and thus only attracted their respective cadres to vote!! It implies that WE NEED A NEW or DIFFERENT SET OF PLAYERS ON THE POLITICAL SCENE, as the existing main parties have FAILED IN THEIR ROLES AS RULING and OPPOSITION PARTIES RESPECTIVELY!! Just take a look at how UPND is slowly losing NW Province their stronghold, two years before General Elections!! Me I did not vote coz I did not like the candidate PF sold to us. We wanted a new person not the same people enjoying the national cake. VOTING APATHY IS A VERY BIG THREAT TO OUR COUNTRY AND SOMETHING NEED TO BE DONE ECZ MUST DO SOMETHING INCLUDING RULING PARTY AND OPPOSITION PARTIES BECAUSE VOTERS HAVE LOST CONFIDENCE OR TRUST BECAUSE OF ROTTEN OR CORRUPT SYSTEMS WE HAVING IN ZED. Zambia to a large extent remains undeveloped not because of politicians but the very population that owns all the instruments of power. Politicians are merely custodians of a political office but the rest of what happens is determined by the nation’s citizen’s who are the CEO’s. The point the author is trying to make is well understood. However, in future if you want to do statistics and compare figures it would be helpful to also report on the number of votes cast for the remainder of the candidates otherwise this is lazy reporting. If the author managed get results for two candidates surely they could get the results for the other candidates for the sake of completeness and clarity. Did you ask those who didn’t vote why they stayed home? If not then shut up because even upnd members stayed home. Did they wish their party to lose? This is simple democracy if only 100 people cast the vote the highest gets 50 the other 50 is divided among the opposition, do not cry foul , its foolishness this is democracy. At the moment PF is popular in most parts of Zambia ,just give them time and space . Criticize and not everything, Appreciate were things are working out and not just criticize, you will be worsting time to add to the development please .